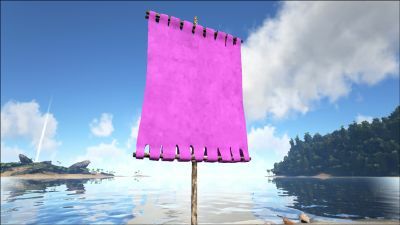 Mark your tribe's territory by placing this and painting it. A simple flag that has one solid panel canvas, and is often used to identify a Tribe or area. The Single Panel Flag does not require a foundation for placement, and as such does not interfere with the spawning of natural resources. It does not snap to other structures. Unlike Boss Flags, Single Panel Flags cannot be picked up again, only demolished. After placing in-game, flag logos can be made by drawing on it or importing the logo from an existing image; see #Loading and Saving Custom Images below, and Painting for more information. The Single Panel Flag differs from a Multi-Panel Flag in a few ways. Firstly, the in-game display region is a little larger. Also, for simple region coloration usage, only a single color can be applied to the flag region, and the crossbars can be painted. The Single Panel Flag is treated as a wooden structure and can not be damaged by hands, stone weapons, or non-explosive ranged attacks. In addition to its preset paint regions, you can doodle on the Single Panel Flag by "attacking" it with a Paintbrush, which will open the "Apply Paint" Menu. Then, click and drag your cursor over the 3D model (like a paintbrush) to draw anything you want. See Painting for more information on doodling. To load Ark PNT files into a Single Panel Flag, the file name must be suffixed with _Flag_Sm_Single_C. The resolution is 256x256, and the aspect ratio in-game is 1:1.33. Also see Painting.